New features that bring you closer to the people, places, and things you care about. Simple refinements to make your phone a delight to use every day. And safeguards to help keep your data secure and your mind at ease. That's what makes Windows Phone 8 the best Windows Phone yet. Here's a sampling of the new, the cool, and the noteworthy. Find out what's in the latest update. Looking for a phone with Windows Phone 8? Check out the Phones page. Kid's Corner. Now the kids can play with your phone—without sending emails to your boss. Quad core support. New Windows Phones now support quad-core processors to pack even more power. Eyes on the road. Use Driving Mode to cut down on distractions while you're behind the wheel. We can even send automatic replies to people who call or text when you're driving. Wallet. Store cards and coupons digitally and browse for local deals. Screen rotation lock. Read on the couch, lying in bed, or hanging upside-down in your gravity boots—it's all possible once you turn on your screen rotation lock. Microsoft account. Once you sign in to your phone with a Microsoft account (formerly Windows Live ID), you'll be able to get apps, games, and music from the Store, play Xbox games with friends, find your phone if it gets lost, and more. Back up your stuff. Send your app list, settings, photos, and text messages to the cloud for safekeeping. 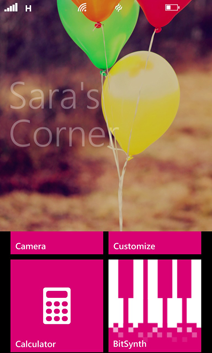 Start screen. Pick a size for each Live Tile to see as much or as little info as you want on the Start screen (for the rest, flick left to the App list). And if you've got a phone with a large (1080p) screen, you'll have a third column of medium-sized Tiles on Start. Ease of access. Make your phone easier to see with optional large type, a screen magnifier, or a high-contrast theme. Tap + send. Share photos, websites, contacts, and more by tapping your phone on another NFC-capable device. Updates on the lock screen. 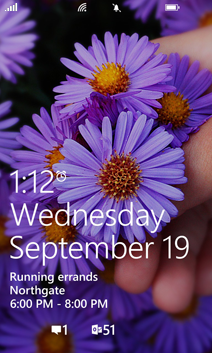 Choose apps to show on your lock screen for a quick or detailed status. Add storage. Use a removable microSD card to add space for music, apps, and more. Hassle-free updates. Get over-the-air software updates—no fuss, no muss, no cables. Reply with a text. Can't pick up? Just tap one of the preloaded text message replies to let folks know you'll get back to them. You can also set up custom replies. Rooms. Rooms are an invitation-only place on your phone where you can privately share a calendar, photo album, group chat, and notes with other room members. Groups sync. Groups now sync to your Microsoft account, so you'll see them in your People list on Outlook.com. Contact sharing. Quickly share a contact card via email, text message, or NFC (Tap + Send). Email by voice. Tap the mic in an email message, then dictate away. Text tones. Assign ringtones for text messages, so you know who's texting you without even looking at your phone. Attach more. Along with pictures, videos, and voice notes, now you can also send your location or share a contact card in a text message. Word Flow Keyboard. The upgraded keyboard has fun and colorful new emoticons to play with, plus your phone now has the power to learn your writing style and predict your sentences for even speedier typing. Power texting. Edit a text you're forwarding and select multiple recipients just by checking boxes. And now your drafts are saved, too. Skype app. Internet calls and video chat on your phone—download the Skype app, then you can get to it right from your contact cards. Bulk delete for messaging. Clear out old text and chat messages in a couple of taps. Just for you. Get personalized suggestions for nearby places to eat, drink, shop, or visit based on what you've been doing and what your friends like. Better browser. Search on a page, protect against iffy websites, and more in the new Internet Explorer 10 for Windows Phone. And for faster, less data-hungry browsing, you can choose not to show webpage images automatically. Delete one or many. Remove a single item from your Internet Explorer history or use check boxes to select multiple items for deletion. Lenses. Download Lenses from the Store to put themes, effects, and more right in your camera's viewfinder. Photo fixes. Crop, rotate, and fix photos right on your phone—plus you can multi-select pictures to delete or share. Back 'em up. Automatically upload your photos and videos to SkyDrive for safekeeping, with the option of full-resolution uploads. Tap to record. Roll 'em—now you can tap the screen to start recording video. Xbox Music. Say goodbye to Zune and say hello to Xbox: the Xbox Music Store is your new place to find music and videos, then stream them from the cloud. Get an Xbox Music Pass for unlimited access to millions of songs for a low monthly fee. Do more with playlists. Like what you're hearing? Select one or more songs in a playlist, and then download them to your phone from there. Handier notes. 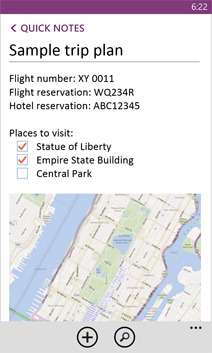 OneNote is now a separate app—pin it to Start to get to your notes in one tap. Take a note with just your voice, search the contents of notes, and get around your notebooks more easily. New notes from Start. The "Pin new to Start" setting in OneNote lets you open a new note from Start with a single tap—no need to dive into a notebook first. New Office Hub. The Office Hub—your go-to spot for Microsoft Word Mobile, PowerPoint Mobile, and Excel Mobile—has been redesigned for simpler, clearer navigation. And now email attachments you've opened will show up there automatically. Improved Office apps. Word now has full-screen reading mode. And when you reopen a doc, it picks up where you left off. Excel gets chart support, smoother navigation, and better cell selection. PowerPoint has new thumbnail and notes views. The Store. The Windows Phone Marketplace is now the Windows Phone Store. The Store learns what you like and recommends apps just for you. As always, all apps are tested and certified by Microsoft. More Live Apps. 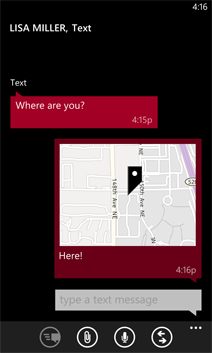 Live Apps deliver updates and info right to their Live Tiles. Now the Store has more than ever, so you can see fresh Groupon deals, CNN breaking news, Weather Channelalerts, and more, right on Start. Even smarter apps. Apps can already talk to your phone. Now they can talk to each other and share information (for instance, your restaurant app could share info with your GPS app). Wi-Fi options. Set your Wi-Fi to be always on or choose to switch to your cellular data plan when Wi-Fi connectivity is limited (or not). Bluetooth sharing. Share docs, pictures, contacts, music, and more. Enterprise power. New business features like mobile device management, private app distribution, and company accounts make it easy to integrate Windows Phone with your Windows infrastructure. Works with Windows. 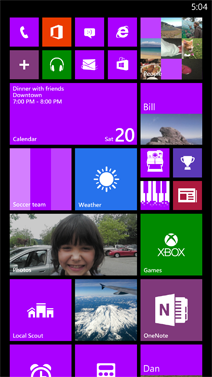 Windows Phone 8 has the same look and feel as Windows 8—so you only have to learn everything once. Office enhancements. Improvements to Microsoft Office Mobile apps—including Word,PowerPoint, OneNote, and Excel—make it even easier to access and edit Office docs anytime, anywhere. My Family. Set up My Family on the Windows Phone website to allow and manage app downloads and game ratings for kids. Some apps and features won't work on phones with less than 1 GB of RAM. To see how much memory your phone has, check the manufacturer's website or your phone's documentation. Some features might not be available in your country or region or may vary depending on your mobile operator or manufacturer. For more information, seeFeature and service availability. Some features are only available if your phone is running the latest version of the Windows Phone software. See How do I update my phone software? for more information about how to update your phone.